Here is a Dean & Son 1st edition 1968 of 'The Boy Biggles' by Captain W.E. Johns. 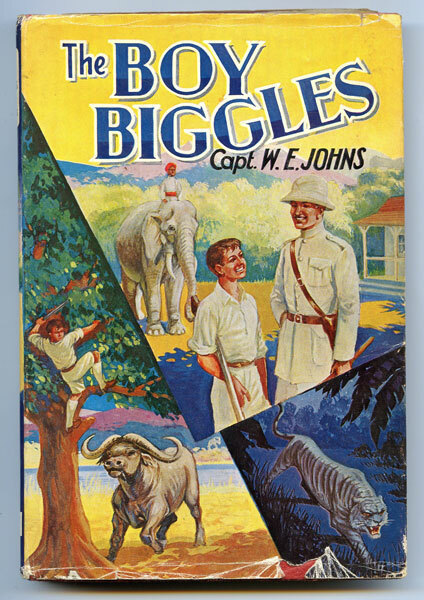 'Some of the adventures of Biggles during the early years of his life as a boy in India, when he lived with his father,an official of the Indian Civil Service, before being sent to school in England. 'This is a hard back in red cloth boards with black titles. It has a great dust wrapper but illustrator is not named. CONDITION: Pages are yellowed to the edges but not torn. Print is still very clear. Boards are in good order. Owners name has been written inside. There is also remains of a label on the first blank page which may come off. The dust wrapper has a small piece missing from the front bottom and is worn along the edges. However it is still pretty good considering its age.